So you are familiar with the crazy party girl side of Culebra. She keeps you up all night long dancing and listening to live music, serves you the best Bushwackers in the Caribbean, she takes you to great restaurants and bars with the prettiest bartenders (especially on Sunday afternoons at Mamacitas!). Stick with Culebra and you’ll party right! Right? Well, yeah. But that’s not all of Culebra. Like all (well most) party girls, she’s so much more. She has a deeper, sweeter, and more laid-back relaxingside of her that you can get to know if you choose to. The mornings are the most peaceful in Culebra. If you can actually wake yourself up in time, you will be greatly rewarded. Have you ever seen a sunrise over the bay? There is not a more perfect way to start your day. Fresh, cool, and gorgeous Culebra! It’s the best time for a long bike ride or run out to Zoni Beach to catch the sun rising over the Culebrita Lighthouse. If you’re karma is really good then you might even see some baby turtles hatching and scrambling for the water. During the day the two most relaxing places to be are hanging in a hammock with a good book or under the water with a snorkel. Its hard to leave your coolers with the huge speakers and tons of cold beers, but it truly is worth it. The feeling of weightlessness in a hammock or floating around in the water for hours is unparalleled to this day. Take some deep breathes and let go of all that stress you’ve been holding so tight on to. Escape into another world of a book or adventure into an exotic and colorful paradise under the sea. 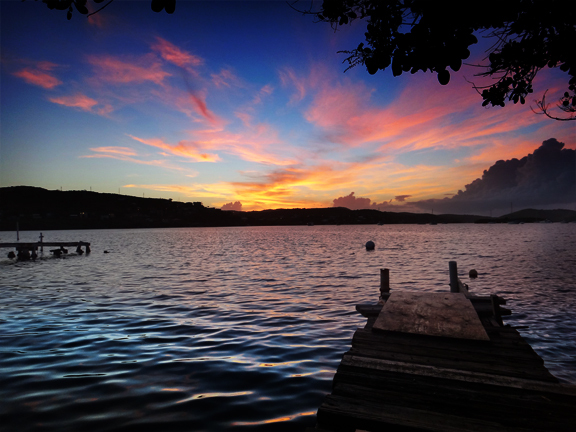 The most romantic time with darling Culebra is when the sun goes down. Instead of putting on all that make up and fancy clothes, she takes it all off to show you what’s underneath… the clouds and sky: the stars! When the moon comes out and shines on the water, Culebra serenades you with her sweet song. With the shooting stars flying this way and that, sparks really are flying. Pure magic. And of course, if you are having some difficulty finding this deeper and relaxing side, there is help out there. Culebra Yoga offers weekly classes as well as private classes. After being in the busy city you forget how to let go, I mean really let go. Yoga is available to everyone and every level. It detoxifies all that nastiness in your body, clears your mind of those nagging thoughts, andopens your heart to a new and refreshing you. Captain George Sails. Learn how to travel to Culebra on boat.